When it comes to a hotel room, I really don’t think I’m that picky. Seriously! I want my room and hotel to be clean, no bedbugs, and to top it all off, I should get no less than great service. The bonus for me is if the view is to die for and at Estate Lindholm, I was fortunate enough to get all of the boxes on my list ticked off including the view. 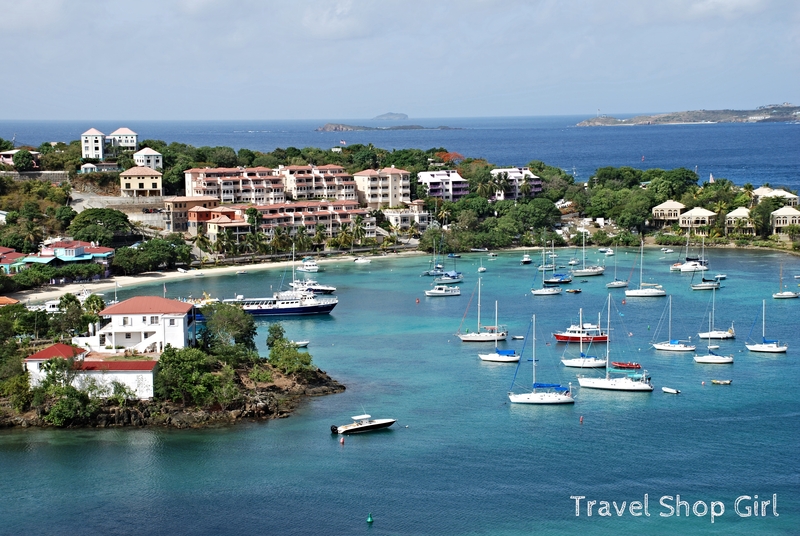 The beautiful Estate Lindholm is an adults only bed and breakfast located on a hill within the National Park overlooking Cruz Bay in St. John, USVI. With 14 rooms (one is a 2-bedroom suite), each with private covered balconies and a view of St. Thomas, St. Croix, and Cruz Bay, no room has a bad view. If you’re looking for a convenient location, especially one that’s only minutes from Trunk Bay, with breathtaking views and outstanding service, then consider Estate Lindholm. My room was more than ample for one person and I could easily have shared it with another person. Having a little kitchen-type area with a refrigerator, coffee maker, and microwave made it extremely convenient to prepare something quick if I need to or at least store bottled water or an adult beverage. TSG Tip: While I always check out every crevice of a room upon entry, including the mattress and the bathroom, I was beyond pleased with the state of cleanliness in my room. That plus the fresh flowers were a bonus that made me instantly feel relaxed and welcomed at Estate Lindholm. When you check into a hotel, before you unpack, take two minutes to go over your room carefully. This way if you do need to change rooms, you don’t have to repack everything. After sleeping like a baby on my first night at Estate Lindholm, I woke up the next morning and headed outside to watch the remnants of what was left from the sunrise over Cruz Bay. While I could look around and take in all of the luscious landscape and views around me, the rooms are situated in such a way that you’ll never see anyone else from your room. Privacy is the word! I’m so used to waking up and hearing cars, traffic, and other noises so to hear birds chirping softly outside the window was absolutely refreshing. Whether you’re here with a group of girlfriends or a romantic getaway, go down to the pool with views of Cruz Bay that are unrivaled. Imagine this: You can take a dip in the pool as the sun rises before starting your day. How amazing is that? A complimentary continental breakfast is served daily adjacent to the pool from 7-10 am daily. I would grab my camera, go down for a cup of tea and an English muffin with peanut butter and pinch myself to make sure I wasn’t dreaming. TSG Tip: Upon arrival you’ll meet the owner, Brion Morrisette, who lives on property with his family. Brion’s family has owned the property since the 1950’s where it was their family residence. Now that it’s a bed and breakfast, you’ll see Brion throughout your stay as he actively engages guests and can offer insight, history, and advice on your stay. On site at Estate Lindholm is Asolare restaurant, which serves dinner nightly from 5:30-9 pm. The owner, Brion Morrisette, grew up in this very building which is now this contemporary Asian Fusion restaurant with the most remarkable sunset views of the Caribbean. While I didn’t have the opportunity to dine in Asolare, I did take a tour of the restaurant and the romantic views, including the palm tree that was desperately trying to make a heart shape. This restaurant is hugely popular and during my stay there was a wedding. Needless to say, those wedding pictures will look amazing! In the 21st century we tend to book hotels via the Internet and earn points with frequent stay programs. While you can choose to stay at a chain hotel in almost any metropolitan area, why not grab a bunch of your friends and choose a more intimate and laid back accommodation like Estate Lindholm? You’ll have the space you need to come and go as you please just like in any hotel while at the same time getting all the personal attention, advice, and assistance you’ll need throughout your stay to make it the best girlfriends getaway you could’ve ever imagined. Estate Lindholm is conveniently located, offers a safe environment for anyone, but especially women traveling alone, and of course, it’s immaculate with amazing views. If you’re looking for a tropical escape, look no farther as this is the place you’ll definitely want to spend your vacation and your next girlfriends getaway.